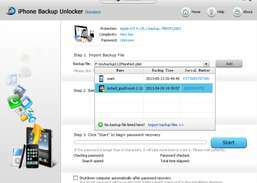 Recover or remove iTunes backup password for iOS devices. Tenorshare iPhone Backup Unlocker Standard could help you recover lost iTunes backup password and unlock iTunes backup password for iOS devices including iPhone, iPad, and iPod, and enables forensic access to address books, call logs, SMS archives, voice mail and email account settings, applications, and so on in these devices. It fully supports iPhone 7/7Plus, iPhone SE, iPhone 6s/6s plus, iPhone 6/6 Plus/5S/5C/5/4S/4, iPod Touch 5/4, iPad Air/mini 2/4/mini/3/2. 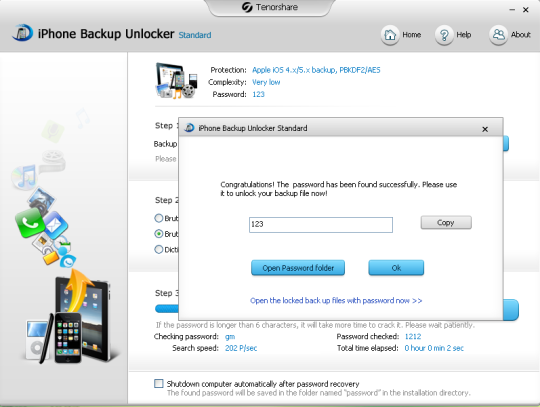 The safe Tenorshare iPhone Backup Unlocker Standard ensures you no data loss or damage to your backup data. Back up and restore iPhone, iPad, and iPod Touch without iTunes. Recover data from iPhone/iPad/iPod devices or iTunes and iCloud backup files. Recover deleted WhatsApp messages on iPhone, iPad, or iPod touch. 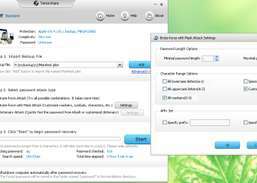 Recover iTunes backup password for iPhone, iPad, and iPod. 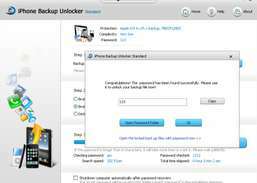 Recover your iTunes backup password. Recover lost data and deleted files from iPhone, iPad, and iPod touch.